If you have a new dog or puppy, a crate is a great way to teach it some boundaries whilst also keeping your dog safe. Training your dog or puppy to enjoy their crate will allow your dog to not only feel safe, it will also make travelling and vet visits easier. Crate training will help use your dog’s natural instincts as a den animal. Using a crate will not only provide your dog with a bed – it is also be a safe spot and haven for your friendly pooch! So how do you train your dog to like their crate and be comfortable in it? How do you make sure you have the correct crate for them? Our Somerzby team has some great tips and tricks to help your pooch love their crate! 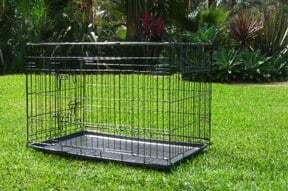 The crate should be big enough for your dog or puppy to stand up, lie down, and turn around in. Crates come in a variety of material and shapes from plastic to metal. Ensure the door on the crate can be closed correctly and there are no broken areas that would allow your pet to escape. Our range at Somerzby come with 2 Doors for easy access with 2 locking latches on each. They also feature a plastic pull out tray for easy cleaning, and are made from black electro-coated quality wire. Click here to see the full range. Getting your puppy/dog to use their crate is a gradual process and will take time and patience. It’s important to create a soft, warm, cosy and inviting area for them. Create a comfortable area for your dog or puppy – place some bedding or blankets in the crate and add a water bottle for them. You can even drape an old towel or sheet over the top of the crate to create a “den” like feeling for them. Make sure you set the crate up in a warm area and let them investigate the crate, as they will want to sniff and smell it. You may find they even enter the crate and lay down in it. Never use the crate as punishment; you want your dog/puppy to associate the crate with something pleasant. if your pet shows sign of anxiety or aggression cease training for a few days. Bring your dog over to the crate whilst using a happy voice and lots of praise. Make sure the crate door is open and can’t close behind them, as this may frighten your pet and will hinder training them to use the crate. Use treats as they approach the crate, as they will then start to associate the crate with rewards and praise. Don’t force them to get into the crate, let them approach at their own pace and let them come and go as they please. Use their favourite toy to entice them further into the crate or drop a few treats inside the crate. 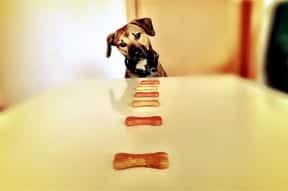 After your dog has been introduced to the crate and has shown no signs of anxiety or aggression, feed them their regular meals inside the crate. If your dog happily entered the crate at the start, then place their food inside the crate at the very back of it. If they are reluctant to enter the crate, place the food as far as they will go in the crate. Each time you feed them, put the food a little further back till they are eventually all the way inside. Remember to give them lots of praise for their effort! It’s important that you observe your pet carefully here. You do not want your pet to become fearful, aggressive or anxious when the door is closed. Try closing the door when you feed your pet and make sure your pet is standing comfortably in the crate before slowly closing the door. Open the door just before they finish eating. With each successive feeding, leave the door closed a few minutes longer until they are staying in the crate for ten minutes or so after eating. If your pet whines, try shortening the time before they are let out – however try to get your pet to stop whining before letting them out as they will quickly learn to whine in order to be let out. Once your dog/puppy is comfortable within the crate, it’s time to increase the time they are in the crate when you’re home. Have the treats ready to go – call your pet over to the crate and give them a treat. Introduce a command to enter (such as “kennel” or “crate”) while pointing to the inside of the crate. Encourage your pet with a treat. Once they enter the crate, praise them and reward them with the treat, then close the door. Stay next to the crate for 10 minutes, and then remove yourself and go to another room for a few minutes. Return and wait quietly next to the crate for a few minutes, and then let them out of the crate. Your aim is to build this up to a full 30 minutes with you mainly out of sight. Once your pet is able to achieve this quietly, then you can begin to leave them in the crate while you’re gone for short periods or letting them sleep in the crate at night with the door open. Continue to crate your pet while you are home also, this will stop them associating the crate with being left alone. While it is a fantastic tool for toilet training puppies and preventing destruction, a dog of any age should not spend all day locked in a crate while you are at work and then again when you go to bed. Be careful that your dog/ puppy does not spend too much time locked in their crate. This can affect your dog’s muscle development and condition. Young puppies shouldn’t spend more than 2-3 hours in the crate without a toilet break as they cannot last that long without relieving themselves. Do not use the crate as punishment – this will cause your dog to associate the crate with a negative experience rather than a positive. Remember the key to training is lots of praise and rewards. Be patient; remember training takes time and consistency. Good luck! We are very excited at Somerzby to introduce our new range of dog crates , from small to XXL. Our pet crates are made from black electro-coated quality wire and feature a pull out tray for easy cleaning and 2 doors for easy access with locking latches on each. The best part about our crates is how convenient and transportable they are. Each one of our crates is collapsible for easy use and storage. Click here to see the new range of dog crates. This entry was posted in Dogs and tagged carrier, crate, dog, puppy, train, training, transport, transporting.